A movie about a group of ordinary people holed up in a diner, surrounded by desert, using machine guns to fight off angels. This should be an awesome movie. Right? Right? Well it isn’t. 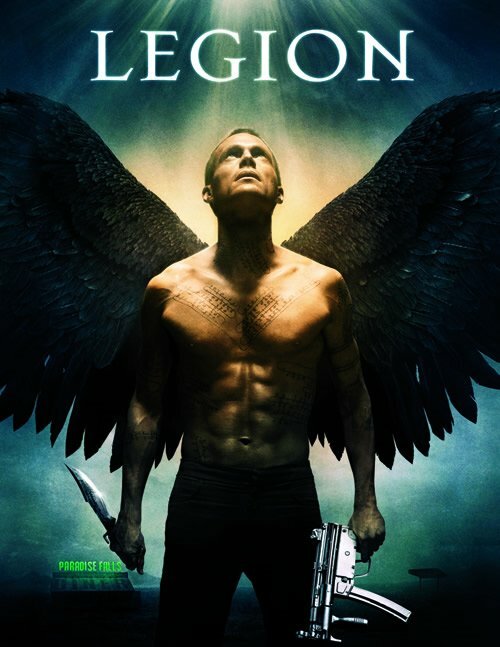 Thankyou Legion for taking a good concept and turning it into a very, very bad movie. You think I might be exaggerating? This is a movie that can’t make up its mind about the kind of flick it wants to be. It starts off as The Matrix, with an angel raiding a hidden armory. Then it becomes The Evil Dead with a group of mismatched, one dimensional caricatures defend their boarded up safe house from creepily deformed possessed people. Seriously, this part of the movie was so influenced by Sam Raimi that I was waiting for Bruce Campbell to float down from heaven and save the day. Finally, the movie transforms into The Terminator as the survivors, in a post-apocalyptic setting, race towards safety as they are pursued by an incredibly powerful being that they have no chance of stopping. Legion, if I have one word of advice to you (and I have many, but this is the most important) it is this: pick a style and stick with it. Be The Matrix. Be The Evil Dead. Be The Terminator. Be what ever movie you want to be. Just. Pick. One. Choose a style and commit to it. It would go a long way towards making this mess of a movie workable. The plot of Legion (I think it had a plot. It was hard to tell at times) is that God has got fed up with mankind once again and has decided to wipe us all out. But instead of using his sovereign power over all creation and taking us out in one hit, he’s decided to send an angel to assassinate a pregnant woman who is about to give birth to a baby who might one day grow up and save people from God. This angel rebels and decides to protect the woman instead. So God sends a bunch of other angels, but instead of coming down as big beefy guys with wings and swords, they possess people. These possessed people use really foul language, take on freakish deformities and get taken out with a few shots from an automatic weapon. Instead of possessing any of the people inside and taking the pregnant woman out when she’s not looking, or overwhelming the diner with sheer numbers, the angels instead trick the defenders into coming outside one by one and picking them off that way. I’d try and explain the ending of this movie, but I’m not sure I could do that without my brain exploding. This movie does not make sense. Not only is it inconsistent with the God of history, it is inconsistent from scene to scene. I was ready to give it a zero out of ten until the last 20 minutes. If the movie had started at that point and developed a 90 minute story continuing from there, I’m sure it would have been a much better movie. There’s one good action sequence in the movie and you have to wait over an hour to see it. Biblically, there are plenty of things I could draw out. I’m going to focus on two things. Firstly, in Legion, God ultimately rewards rebellion. Those who resist him and try and do things their own way and not God’s way end up gaining God’s favour. God sees the rebellious and admits that he was wrong and the rebels were right. Which funny enough should end the movie, but somehow they’re still fighting when the credits roll. I told you this movie doesn’t make sense. This is the exact opposite to how God acts in the real world. In Genesis 6, God is going to wipe out everyone because of their rebellion and wickedness. It’s only Noah, who is obedient and righteous that God spares. God punishes rebellion and sin and rewards obedience. The exact opposite of this gospel truth is portrayed in Legion. Secondly, God’s plans to wipe out humanity in Legion are inconsistent with the truth of the Bible. In Legion, God wipes attempts to wipe out humanity because he has had enough. And then does a pretty poor job of it. However, the Bible shows us that instead of destroying us, God has chosen to redeem us. By sending Jesus, the punishment for sin has been dealt with. Whoever follows Christ has been saved. God responds to rebellion with love, not vengeance. The only reason that God hasn’t finished the job yet is because he is patient, loving and kind. The Lord is not slow in keeping his promise, as some understand slowness. He is patient with you, not wanting anyone to perish, but everyone to come to repentance. (2 Peter 3:9) But when the time does come for God to deal with sin once and for all, he’ll do the job right. There won’t be any resistance, there won’t be any fighting back. Christ will rock up and every knee will bow. There’s a lot of potential in Legion. It’s a shame that almost none of it bears fruit and produces a movie worth watching.